Although originally designed and built for free flight, this fairly large scale mode of the Bristol Scout monoplane could easily be adapted for control line or radio control flying. With a wingspan of 46 inches and a robust airframe, it can withstand the rigors of aerobatic flight. Replacing the glow fuel engine with a modern brushless motor and LiPo batteries helps keep the vibration and therefore wear and tear to a minimum, and also avoids getting messy fuel all over your nice airplane. Since these plans are no longer available, you can click the one presented below to get the full resolution version. It was only one page wide, so it is a bit fuzzy. Specifically designed for easy yet true to scale construction, this one-eighth scale fighter from W.W.I. by Brian Barton is ideal for 1cc to 1.5cc. 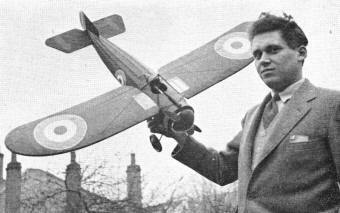 Designer with his Davies-Charlton Spitfire powered prototype in picture opposite shows off the realistic transparent wing panels and single gun. Model is a slow flier, very easy to build with scale stringers and rib positions. A typical example of British procedure for dealing with a new and advanced type of aircraft that will outclass all others, was displayed in 1917 when R.F.C. squadrons were eagerly awaiting delivery of the Bristol Monoplane Scout in France. The Monoplane, first flown in 1916, then having a maximum speed of 132 m.p.h., with a 110 h.p. Le Rhone rotary engine, was highly manoeuvrable and very aerodynamically clean for its time. These features of the aircraft were altered very little in the production version and the design appeared promising especially to the pilots in France who had "got wind" of the aircraft's performance. But despite this the Monoplane was only ordered in small numbers and did not even see service in France on the Western Front, but was relegated to duties in the Middle East that did not warrant an aircraft of such quality. Many reasons have been given as to why the Monoplane was rejected for use on the Western Front, one being that the ban imposed on monoplanes in 1912, was still present in the minds of some when the type was considered for acceptance into the R.F.C. (The ban was imposed after a number of accidents involving structural failure with Morane Monoplanes, and was never quite forgotten until the Spitfire and Hurricane had flown and were proved safe and successful). The official reason, however, was that the landing speed was too high (at 49 m.p.h.!) This in turn was thought to have been created to hide the unwanted publicity that a certain high ranking officer obtained through his lack of skill, resulting in the crashing of one of the Monoplane prototypes. Knowing we British, this may well have been the reason! The service that the Bristol Monoplane did see, in the Middle East, was in Mesopotamia in the hands of 72 Squadron, and in Macedonia with 17 and 47 Squadrons, A few were also sent out to Palestine, but other than the capture of the towns of Kifri and Kirkuk from the Turks in May 1918, the Bristol Monoplane Scout did not contribute greatly towards the success of the Allies in the First World War, and after the War had ended, what appeared to be a most successful single seat scout aircraft and by some, was thought would gain complete air supremacy for Britain, disappeared unnoticed from the service scene. Our model, scaled down to one-eighth size (in keeping with many of our other W.W.I subjects) from 30 ft. 10 ins. to 46 ins. span incorporates all the details of the full-size, such as scale ribs, stringers, Vickers gun and downward vision panels at the wing roots. The aim was to obtain a realistic model with relatively light weight construction methods to reduce wing loading and so get true scale appearance in the air. Stringers on the fuselage are disposed to obtain correct effect, and with the muffled note of the 1 c.c. or 1.5 c.c. engine behind that large spinner, the Bristol Monoplane is as near as one can get to being a perfect replica of the full size. Flying speed is slow, and stability such that it will recover from any dud launch or gust upset. It is also remarkably easy to build. Designer Brian Barton is one of the most prolific model builders of our acquaintance, and likes building so much that he is continually engaged in making ranges of Astro Hogs, Smog Hogs and the like for lazy radio control flyers. 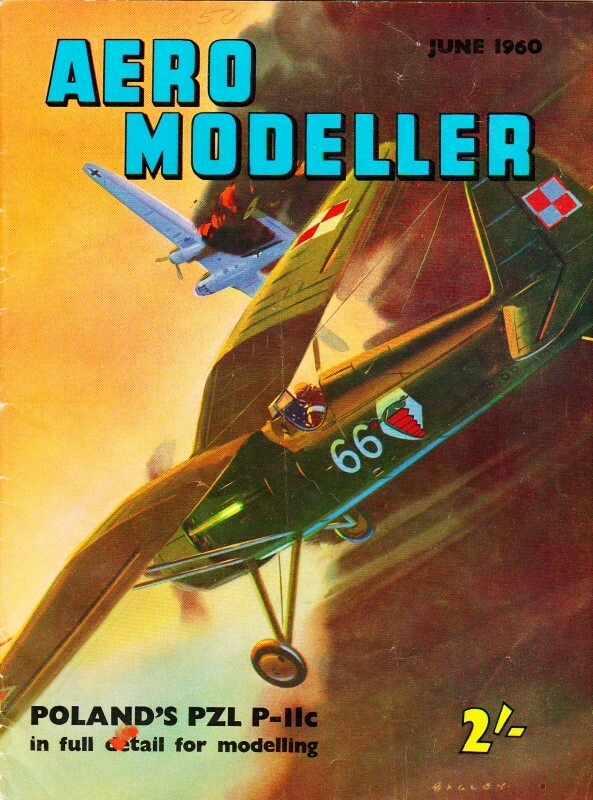 So when he wanted to create this scale model for his own flying enjoyment, he sensibly applied his accumulated experience of kits and plans from all countries to produce a building system that almost qualifies for beginner status. Moreover, it is quick construction, and abbreviated stage by stage information is included on the plan. 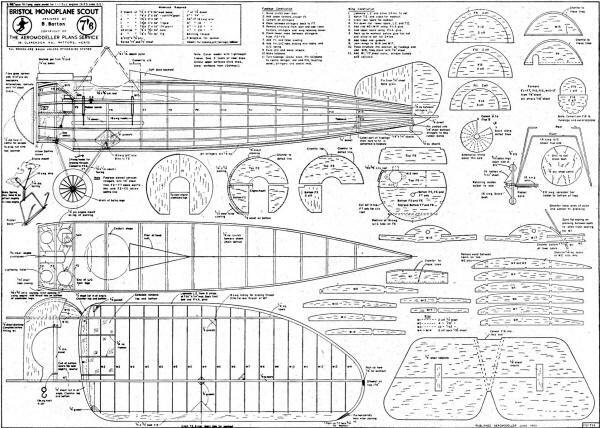 The multi-stringered circular section fuselage is built around a horizontal crutch, first made over the plan view. 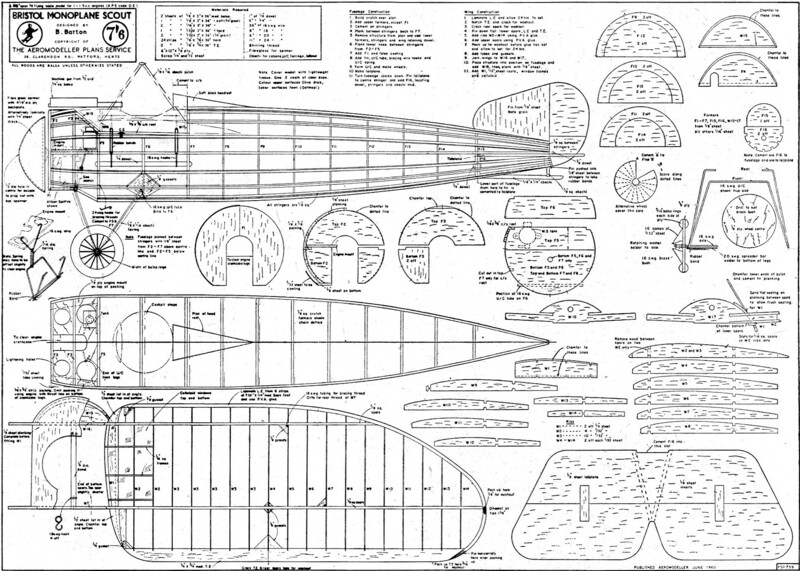 By applying half-formers and lining up with master stringers, the torpedo like fuselage is soon taking shape. Cowling is not at all involved, and the only part likely to bog down the novice is the large spinner. 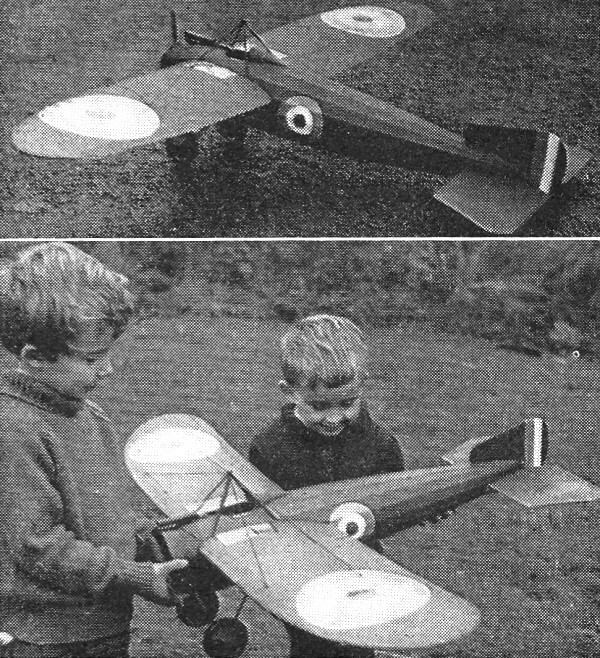 While it might not be a scale model any longer, the Bristol Monoplane could very well be flown without the spinner if need be. Wings are one-piece with ingenious seating on the fuselage for knocking-off in the event of a crash, and the transparent sections for pilot downward visibility add to the appearance of centre section weakness although in fact the wing is very strong. Cabane and bracing over the wing are dummy only, not contributing to strength. All tail surfaces are sheet, and inset stiffeners in the tailplane prevent warping. What could be more simple? Wing tip washout and the flat bottomed airfoil are non-scale aids to model stability, permitting a wide centre of gravity position tolerance although the ideal balance point is that shown on the plan. Coloured olive drab on the upper surfaces and buff on the undersides, with the roundels outlined in white, the Monoplane can fly on a scale prop diameter of 12 inches, even with only 1 c.c. power. The Davies-Charlton Spitfire used on the prototype was turning very slowly indeed; but nevertheless most surely with so large a fan when on test flights. For the man who wants his realism to come without too much effort we cannot think of a more suitable choice than this World War I subject. Full size copies of this 1/7th scale reproduction are available price 8s. Including post from plans service, quote plan FSP 759 when ordering.